The answer will surely challenge your understanding of the oil situation. The U. S. Geological Service issued a report in April ('08) that only scientists and oilmen/women knew was coming, but man was it big. 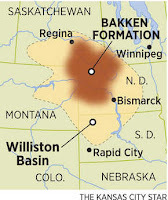 The Bakken is the largest domestic oil discovery since Alaska's Prudhoe Bay, and has the potential to eliminate all American dependence on foreign oil. And it stretches from Northern Montana, through North Dakota and intoCanada . For years, U. S. oil exploration has been considered a dead end. Even the 'Big Oil' companies gave up searching for major oil wells decades ago. However, a recent technological breakthrough has opened up the Bakken's massive reserves... and we now have access of up to 500 billion barrels. And because this is light, sweet oil, those billions of barrels will cost Americans just $16 PER BARREL!That's enough crude to fully fuel the American economy for 41 years straight.